A Creative Journey in Fabric, Paint & Stitch. Make treasured art quilts from bits of cloth, stitched motifs, and painted details. 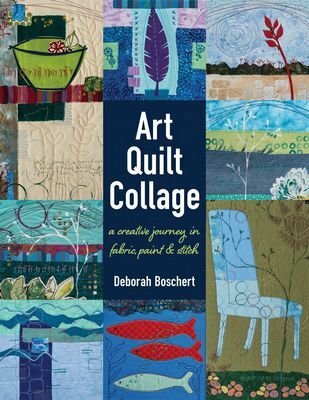 Dip your toes into the world of art quilting with mixed-media techniques, practice exercises, checklists, and work-along projects presented using 8 design guides. This visual, step-by-step guide will help you unlock your own artistic vision as you quilt in a series, finish small art pieces, and incorporates meaningful symbols into your work. Tap into your creative muse! Art quilt inspiration, techniques, and checklists presented in 8 easy to use design guides. 96 pages, color, 8.5x11in, by Deborah Boschert's, Published by C&T Publishing.